Muskrat Removal, Muskrat Trapping & Muskrat Control Experts in VA. Our Richmond, VA Wildlife Control Technicians are Certified Muskrat Removal Specialists who possess the knowledge and skills necessary to get rid of muskrats that are causing you problems. We utilize the most effective muskrat removal techniques to resolve your nuisance muskrat problem as quickly and humanely as possible. 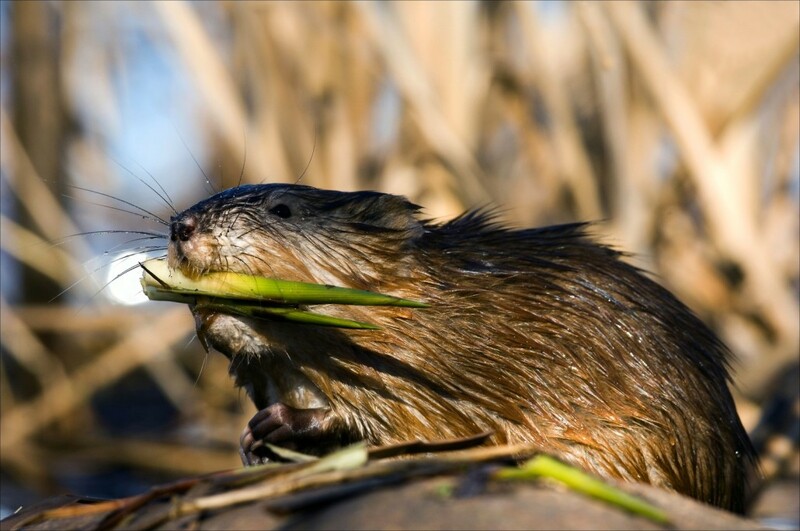 Our Muskrat removal experts are trained in Muskrat removal, Muskrat trapping, Muskrat control, Muskrat capture, Muskrat management and how to prevent future Muskrat damage. Call us at (804) 729-0046 or toll-free at (888) 824-7383 to schedule our Muskrat removal services. The muskrat is the largest microtine rodent in the United States. It spends its life in aquatic habitats and is well adapted for swimming. Its large hind feet are partially webbed, stiff hairs align the toes, and its laterally flattened tail is almost as long as its body. The muskrat has a stocky appearance, with small eyes and very short, rounded ears. Its front feet, which are much smaller than its hind feet, are adapted primarily for digging and feeding. The name muskrat, common throughout the animal’s range, derives from the paired perennial musk glands found beneath the skin at the ventral base of the tail in both sexes. These musk glands are used during the breeding season. Musk is secreted on logs or other defecation areas, around houses, bank dens, and trails on the bank to mark the area. Damage caused by muskrats is primarily due to their burrowing activity. Burrowing may not be readily evident until serious damage has occurred. Where damage is occurring to a crop, plant cutting is generally evident. In aquaculture reservoirs generally maintained without lush aquatic vegetation, muskrat runs and burrows or remains of mussels, crayfish, or fish along with other muskrat signs (tracks or droppings) are generally easy to observe. Muskrats are common and widespread throughout Richmond, VA and other areas of Central Virginia. Muskrats mainly nest in shallow marshes with abundant cattails and are less often found along streams or in wooded swamps. Muskrats make a lodge or home out of cattails or sedges and most damage occurs from digging holes along ponds, creeks, rivers and lakes to create a bank denning site. Muskrat damage is a primary concern when their burrowing activity occurs along dams and spillways. Burrowing may not be readily evident until serious damage has occurred.